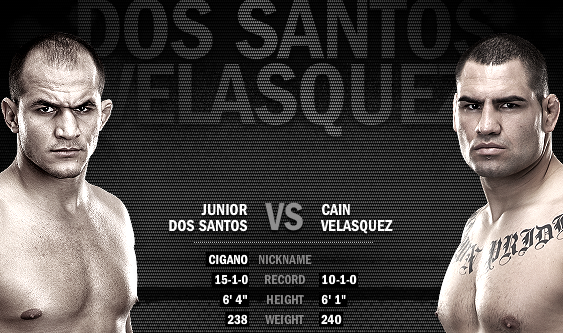 In the main event of UFC 155, UFC Heavyweight champion Junior “Cigano” dos Santos will defend his belt against former champion Cain Velasquez, the man he beat to earn the title. The big question heading into their first matchup was whether or not dos Santos had what it took to deal with the dominant wrestling of Velasquez. That ended up being a total non-factor, though, as dos Santos completely blitzed Velasquez with strikes en route to a very easy knockout. Will things play out differently this time around? Will Velasquez be able to get his wrestling game working and take dos Santos to the mat, or will dos Santos overwhelm him with strikes yet again? Cain Velasquez, the former UFC Heavyweight champion, has a dangerous mix of powerful wrestling, knockout power, and amazing hand speed. He’s great in the clinch, devastating from top position, and throws much harder and faster than most UFC Heavyweights. It’s obvious, though, from watching their last fight that he does not have what it takes to stand and box with dos Santos. If he wants to have a chance in this bout, he is going to have to get his wrestling going as early as possible. If he can make dos Santos try to work off his back he is in a great position to wear him down with ground and pound and eventually win, but if he has to stand with the champion for any period of time he is going to get knocked out again. Junior dos Santos is, without a doubt, the scariest striker in the UFC’s Heavyweight division. His boxing is fast, accurate, and devastatingly powerful. He has blitzed his way through the Heavyweight division, handling each new challenge with relative ease. Many pundits considered Velasquez a stiff challenge for dos Santos, but he knocked the former champion out in barely over a minute. In his last fight, he exploded Frank Mir, another former UFC champion, midway through the second round. If this fight plays out on the feet for any period of time, dos Santos will win. The only question is how well he will be able to work off his back if Velasquez manages to take him down consistently. Basically, this fight comes down to whether or not Velasquez can establish his wrestling game consistently in the early rounds of the fight. If he can, it is possible that he can tire dos Santos out with smothering top control and soften him up with hard shots from top position. I don’t think that is going to happen, though. While it may last a bit longer, I think this will basically be a repeat of their last fight. Velasquez doesn’t have what it takes to stand with dos Santos, and he will have that proven to him fairly early on. Dos Santos by T/KO. Prediction: Junior Dos Santos by second round T/KO. Below, use our Odds Calculator to check your potential winnings.